The Cove at Fairview has many wonderful amenities. There is a gas and a charcoal grill, as well as an outdoor fire pit. Enjoy Koi Falls - which features two Koi ponds, several small waterfalls, and water plants. Visit our two horses – they always love carrots. Fresh eggs from our chickens provided. The Cove at Fairview is located just 15 minutes from downtown Asheville and the Biltmore House. We are only 10 minutes to The Blue Ridge Parkway. We have Specials on Horseback Riding & Massages! After retiring from a 33 year career in sales management/ marketing, we visited our oldest daughter Etta and fell in love with Asheville. We moved to the Asheville Area in 2002 and lived in the house that became our first rental, “Our House.” (We built a cabin on the property and moved into it). Soon to follow, came our youngest daughter, Farris, and her now husband Danny. In 2009 their daughter Alyssa arrived and in 2015 Haley was born, making this a true family business. We fell in love with Asheville and all it has to offer. We then decided to share the beauty of the Asheville Area and the hospitality of the Smokey Mountains with others. “Our House” and “My Roundette” were on the property when we originally bought it. Both have since been remodeled. We then purchased additional land and built “My Place,” “The Huntley,” and “The Garden Cabin.” “Log Gap” and “Prayer Ridge” were both bought at separate, more remote locations. Both were extensively remodeled. The benefit of staying at “The Cove at Fairview” is the unique experience. Each home offers you a different experience in small ways – outdoor fireplaces, swinging beds, and a fifty mile view are just a few. Also, enjoy waterfalls, Koi Ponds, a Lotus Pond, horses, chickens (enjoy fresh eggs), donkeys, goats, native plants, & flower gardens. By staying here, you are nestled into all of the beautiful natural settings in this peaceful cove. While being very private and close to nature, you are still afforded all of the conveniences of technology and are located near all this area has to offer. Truly a place to come and renew yourself. Kick back, relax, and have a true retreat or a wonderful place to land after an exhausting day of fun (downtown is only 15 minutes away). Features Shower with River Rock Flooring. Shampoo/ Conditioner, Soap, Towels, Robes, Washcloths and Toilet Paper provided. Enjoy the view of the rolling hills from the back deck. Laundry Detergent and Dryer Sheets provided. Bath towels, spa towels, and robes are provided. Coffee, Creamer and Sugar provided. Everything you need to cook in or grill out! Garbage disposal. Paper towels, Dish towels, Hand soap, Dish soap and Dishwashing detergent provided. Lotus Pond with Koi Fish. Flower garden surrounded by a locust wood wigwam fence. Chicory Plants, Lamb's Ear, and many more beautiful plants. Robes and Spa towels provided. Our stay was so relaxing, but yet there was plenty for us to do nearby and in downtown Asheville. Our favorite part was hiking at Dupont Falls, which Frank recommended. It was about a 45 minute drive but SO worth it. This place holds a very special place in my heart because my boyfriend of 5 years PROPOSED at the base of a beautiful waterfall. We will be back to stay at "My Roundette" in the future! My Roundette is a lovely, cozy cabin nestled on the property nestled among the trees. We absolutely loved our stay. With a big, snow storm moving in, we knew our stay may be cut short. Frank called us while we were in route to Asheville to discuss the weather which was incredible thoughtful and helpful. He arranged for us to go horseback riding the next day which was great! Upon arrival, Frank walked us through our cabin explaining everything and even insuring we had great recommendations on local restaurants, shopping and other things to do. The cabin itself is adorable and super cozy. They thought of everything you could possibly need down to big, snuggly robes. When we walked in there was bread baking and fresh eggs in the fridge. As the day went on, the smell in the cabin from the bread baking was amazing and was delicious later on that afternoon. The property itself is beautiful with tons of beautifully landscaped gardens, koi ponds, hammocks, swings and benches throughout. You can tell so much love has gone into making The Cove at Fairview a truly peaceful and tranquil place to come and get away from it all. I couldn’t wait to buy some carrots and feed the animals.... donkeys, horses, goats and chickens! We are huge animal lovers and that just topped off a perfect stay! As it turned out, the weather just wouldn’t let us stay and Frank worked with us so that we wouldn’t lose our nights stay. WE WILL DEFINITELY BE BACK!! In fact, we are already planning our return! Thank you Frank for making us feel so welcome and right at home! Came here a day after our wedding, and we are so happy we did best weekend ever. We arrived a little late due to our flight. frank was there to greet us and welcome us. Over all this was a very wonderful stay. Super relaxing and it felt like the perfect getaway. If your thinking about staying, please just go ahead and book it!!! You will fall in love with all it has to offer! The owner was VERY easy to work with and accomodating for our evening arrival! All correspondence was handled swiftly! The surpriise of eggs and bread from the family chickens and a daughter was a real treat! Easy run to the Biltmore Estate and the owner helped arrange for a Masseuse to come in! We will gladly visit again! We had a great time and it’s so close to Asheville! The Cove at Fairview has an unbeatable location, and this area offers something for everyone to do. We are just 15 minutes to The Biltmore House (We offer discounted tickets), The Grove Park Inn, and Downtown Asheville - enjoy fine dining, festivals, shopping, +. Go horseback riding just 5 minutes away. 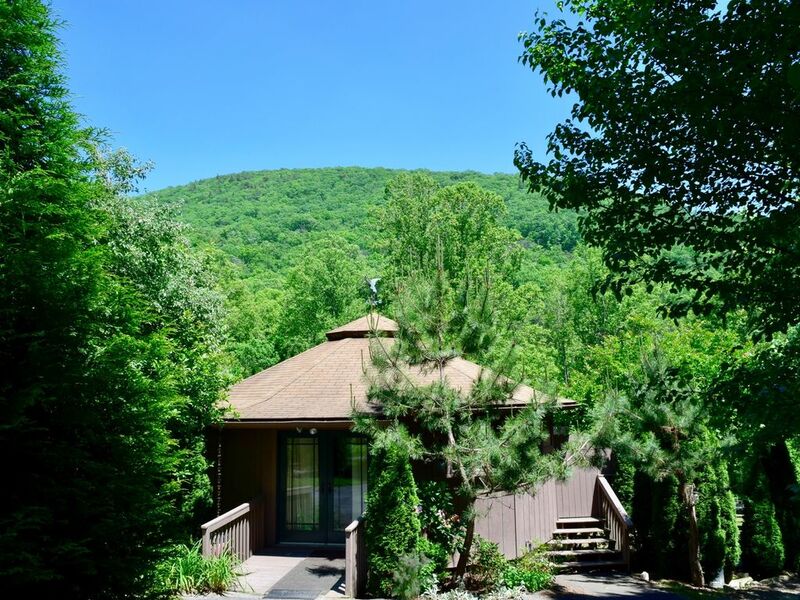 We are just 10 minutes to the Blue Ridge Parkway (panoramic views at overlooks and great hikes), and 15 minutes to the Blue Ridge Parkway Folk Art Center. Enjoy the views as you drive up to Chimney Rock and Lake Lure – less than twenty mountain miles up to Lake Lure. We are located less than thirty minutes from the Asheville airport. There are many attractions nearby – museums, a Nature Center, golf courses, Mt. Mitchell, Sliding Rock and the French Broad River. Wolf Ridge Ski Resort is 45 minutes away. Nourish yourself in this peaceful cove while you enjoy the hospitality of the Smoky Mountains.